Coverage: Live on BBC TV, Red Button, Radio 5 live, online, mobiles, tablets and app. 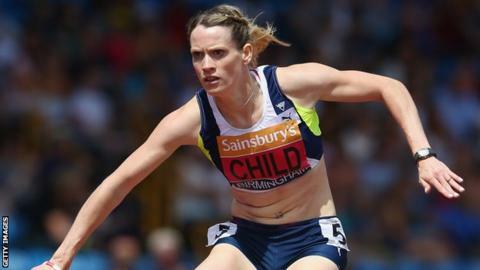 European women's 400m hurdles champion Eilidh Child admits the latest revelations surrounding doping in athletics "make her heart sink". The Scot, who is preparing for the World Championships in Beijing, said: "At the moment people associate our sport with cheats and that's sad. "I love my sport. I want people to think about all the positive things that come from athletics. "We're all working really hard and we want it to be a level playing field." Child, who won silver at last year's Commonwealth Games, feels "clean" athletes are not getting the support they deserve and has called for stricter rules to be put in place to make sure cheats are caught. She told BBC Sport: "We've got a brilliant system here in the UK, where we can get tested wherever, and that needs to be implemented all over the world. ''It's not fair that we're all adhering to the rules over here, getting tested regularly, and there are other athletes who aren't. "Hopefully these new revelations will kick-start a big campaign to get the drug cheats out of athletics." On Monday, Thomas Bach, president of the International Olympic Committee, said his organisation would take a "zero tolerance" approach should allegations of widespread doping, published by the Sunday Times, be proven. Those allegations follow claims made by BBC's Panorama that successful coach Alberto Salazar violated anti-doping rules, which he denies. "It's difficult and it's sad," added Child. "You want to go up against these girls and know that you've finished fourth or fifth against people who have trained really hard. "You don't want to know you've been beaten by someone who has cheated their way to get there. "Hopefully when I do race against these girls they are all clean, but when more stories come out you start to doubt it slightly. "It's a bit upsetting because you feel it's the clean athletes who are not really getting supported in this situation." A year away from the Olympics in Rio, Child is looking for a strong performance at the World Championships later this month. "The World Championships before any Olympics is always a big deal," she said. "There is a lot of competition in the 400m hurdles. It will be tough to come away with a medal. "I feel like a completely different athlete going into this Olympics in comparison to 2012. London was a little bit too soon for me. It was my first Olympics and was an incredible experience. "I definitely feel a lot more confident going to Rio that I can bring something back. "With the Commonwealths in Scotland and coming away with gold from the Europeans having gone in as favourite has given me confidence knowing I can deal with pressure and perform well."